Now the other day I had a colleague of mine refer to the need to get “out” of the development industry (software development, that is) because of a variety of reasons, mostly centred around the need to report through the artificial introduction of agile, scrum, lean, whateveryoucallit methodologies. Whilst I don’t want to discuss the merits and pitfalls of said methods (it could go to great lengths), no the purpose of this blog is something a little more personal. (By the way, if you haven’t figured it out yet, the best methodology is your own: find something that works for you and your peers and stick to it). The blog subject is probably something more of a giveaway and I feel particularly inspired tonight, partly due to the weather (but enough about that) and partly because it’s been far too long since I last blogged. You see, I struck upon one comment about being in the “industry” for 17 years and I felt a change is probably a good thing at that point in time. I think I’m almost there, perhaps, but it’s not like 17 is a magic number that you strike and suddenly need to change. You could say it’s very similar to the time of a midlife crisis; you know when you go and buy a open-top roadster in the Summer and then regret it and the sun-burnt bald spot by the Winter. So the year is 2015 and I thought “What was I doing way back 17 years ago?” High school of course. So let’s wind forward 1 year. To pretty much exactly 16 years ago. In 1999. Year 10. It would’ve been school holidays. My brother had been working in the Blue Mountains in a computer service and repair joint, operating out of a cool shed at the back of a guy’s place for a number of years now. My brother had always been the hardware guy; into physics and electronics and really handy with a soldering iron. Something that I still struggle with today. But I’m getting better, each time. I blame the tools. I managed to get a school holiday gig of a few days here and there because my brother had told the boss I was good at programming. That’s what it was called backed then. And it hasn’t really changed all that much to this date. In truth, I had been making overly complicated menu systems in QBASIC for years (blog coming soon on that) and did dabble in a bit of the then “internet” - surfing the world wide web, as the TV programmes used to say. Sounds so dated and daggy now. The gig involved building a visual representation of a factory full of looms - weaving anything from carpet backing to shade-cloth - and then attaching monitoring data to each graphical loom. Looking back it was actually not a bad project really; it brought an identifiable visual representation of the actual factory layout combined with informative information - not overload, not too much 3D. Neat but nothing brilliant. 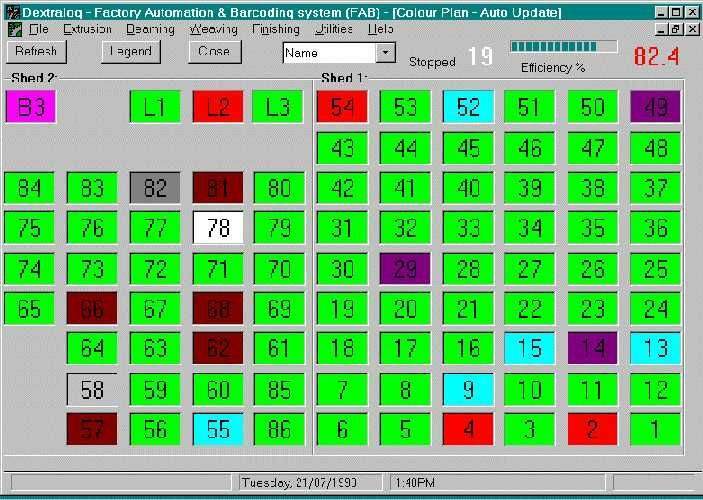 The bit I mainly worked on was turning this into a customisable report, which I don’t have a copy of with me (sadly) but what I do know is that it heavily relied on Clarion, both the DOS version (to collect the data from a serial-based device attached to each loom) and the Windows version for monitoring. Clarion is an interesting language, built from templates with small sections that you could fill in your own custom code to change the functionality. It had an emphasis on writing stuff quickly, which is good once you’ve done a few programs you don’t want to get bogged down in the detail. It was also good with connecting to database files (SQL wasn’t used by us at the time) and had a bit of a cool build process, which seemed to take a while and made you feel really productive. I probably wouldn’t use Clarion today because it feels pretty old fashioned among all the other tools on offer but it was definitely written by a programmer at heart to service other programmers. 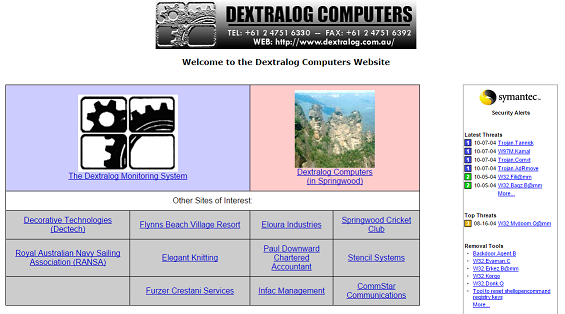 I did a bunch of other stuff whilst at Dextralog (which incidentally was sold a few years after opening a bricks and mortar shop in Springwood, NSW) including ‘designing’ websites, something that I still do today (boy how nothing changes). What has changed, however, you will soon guess. Lovely for 2003 or 2004 perhaps. Actually it’s pretty poor by today’s standards. One thing that the web had for it back then was dial-up. And dial-up meant websites were not about anything rich or heavy, but just text and a few GIFs. Oh and blinking text. And who remembers marquee? That’s for another blog. What am I working on now? An initiative for ABC iview. And it’s a hell of a lot more interesting than monitoring weaving looms in a factory!